Very, very slowly, about 29 miles beneath you, 50 quadrillion tons of bedrock are bending toward the day when low-car life in Portland ceases to be optional. Someday, maybe tomorrow, a 700-mile stretch of Northwest coast known as the Cascadia Subduction Zone will rupture with a quake equal in strength or stronger than the one that struck Japan last year. 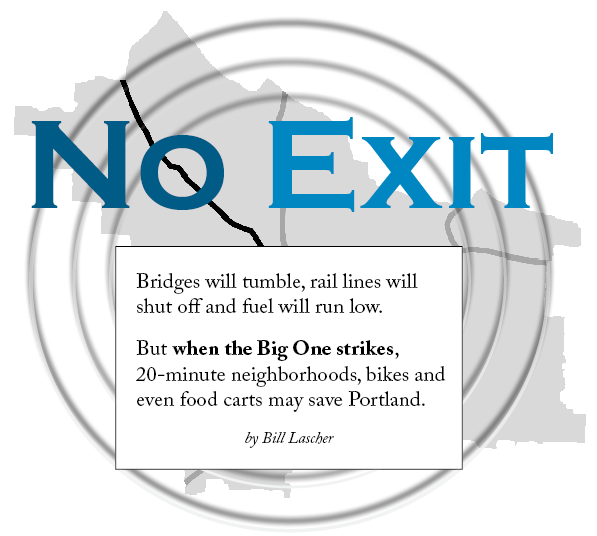 Such a temblor, or even a more moderate one centered on one of three faults under the city, will likely shatter Portland’s brittle infrastructure. Even the bridges and overpasses that aren’t immediately damaged by swinging counterweights or sliding soils (which are likely to hit every major bridge except the Burnside and Marquam) will be shut down for inspections, shutting off food and fuel deliveries to much of the city for at least two days. And the blockages may last a long time if inspectors can’t reach the structures, or if aftershocks start the whole process over again. Interstate 84, Interstate 5 and the Willamette and Columbia rivers may all be impassable, city documents report. But those damages would only deepen the problem that is likely to follow even a moderate earthquake near the city: a crippling shortage of motor fuel. 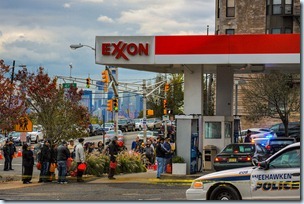 Superstorm Sandy forced New Yorkers to wait in line. A Northwest quake could shut off Oregon’s energy and fuel supply almost completely. Oregon is one of 16 states that processes no oil of its own. Ninety percent of its refined petroleum arrives by either an insecure pipeline or a tanker from Puget Sound. A quake could fracture the pipe, a tsunami could block the shipping channel and shaking could destroy the vulnerable storage facilities that serve the entire state. All fuel that makes it to Portland arrives in a six-mile zone of tank farms and terminals built along the wet soils of the Willamette River, between Sauvie Island and the Fremont Bridge. This critical energy infrustructure hub also houses electric transmission stations and natural gas terminals, and the entire area is at risk of damage from even a moderate quake, let alone a cataclysm. Pipelines, piers and fuel tanks there – storing, on average, 3 to 5 days of fuel – were all built in a liquefaction zone, before codes accounted for the area’s seismic dangers. Only three storage tanks have been prepared for liquefaction. “Western Oregon will likely face an electrical blackout, extended natural gas service outages, liquid fuel shortage, as well as damage and losses in the tens of billions of dollars in a future major Cascadia earthquake,” a report from the state Department of Geology and Mineral Industries warned in August. MAX trains will go offline, their overhead electrical wires useless. Highways are likely to be blocked. TriMet buses will run on new, improvised routes until their garages run out of diesel. City officials will ask Portlanders to stay put for at least five days in their broken city. And that’s when we’re likely to discover that Portland will be better off in an apolocalypse than it looks. It turns out Portland has been preparing for disaster for a generation. We just didn’t know it. “Portland’s thriving alternative transportation and food networks, including cargo bikes and food carts, will be recruited to assist with the delivery of food, fuel, water, medical supplies, etc., to each of these neighborhood hubs,” says an April 2012 appendix to the city’s emergency operations plan. Nobody’s told the cart owners yet. But since carts can become rolling mess halls and their pods are well-known gathering spaces, Portland Bureau of Emergency Management spokesman Randy Neves says it makes “perfect sense” for carts to help if they’re able. 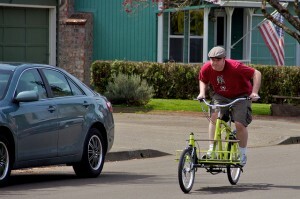 Another tool in Portland’s disaster arsenal has drawn more attention: its robust bike culture. Indeed, the earthquake appendix says bicycles may be the “most practical” way for anyone to get around if a quake damages pipelines. Ethan Jewett, a leader in the official neighborhood emergency team (NET) for the Woodlawn area, noted that bike sales skyrocketed in Japan after its 2011 quake. “Many of the functions in a response, of going to get supplies, of carrying communication equipment, of doing the NET mission, of residents doing supply runs – they all can be facilitated by bikes,” Jewett says. With maybe 5% of pedal trips in the city already happening on bikes that can haul cargo – that’s the rough estimate from Clever Cycles‘ Eva Frazier – Portland is unusually ready for action. It’s a good reason to own a wrench, a patch kit, and more tubes than you think you need, says Jewett. After all, your neighbors might need a tuneup, too. 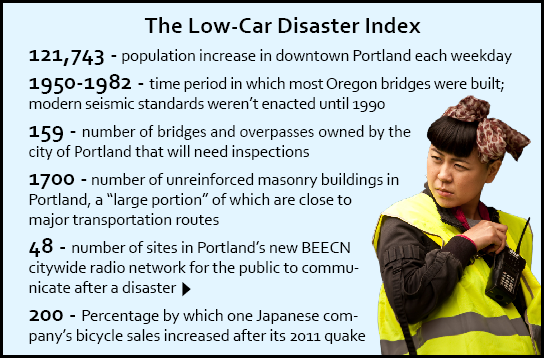 But Jewett also admits that not everyone can ride a bike, and that Portlanders are far less prepared for a quake than the Japanese were. He said it’s also important to get to know your neighbors, their needs, and who’s been trained in emergency response. The city’s official plan estimates that its NETs will triple in size after a disaster as uninjured survivors look for ways to help. And that’s the final way Portland’s low-car culture will be useful in a disaster: It’s helped us build a city whose citizens interact. And as prepared as people like Jewett may be, many of us struggle to put food on the table, let alone in a disaster kit. Bill Lascher is a Portland-based freelance journalist. His website is lascheratlarge.com. More tips on how to prepare your home and family for a quake at pdx.be/Resilience. Gas shortage photo by Bee Collins. Cargo bike photo by Will Vanlue. Radio user photo by Garry Knight. Post by michael at 9:45 am December 14th, 2012. Like what you see? Get future posts by email.